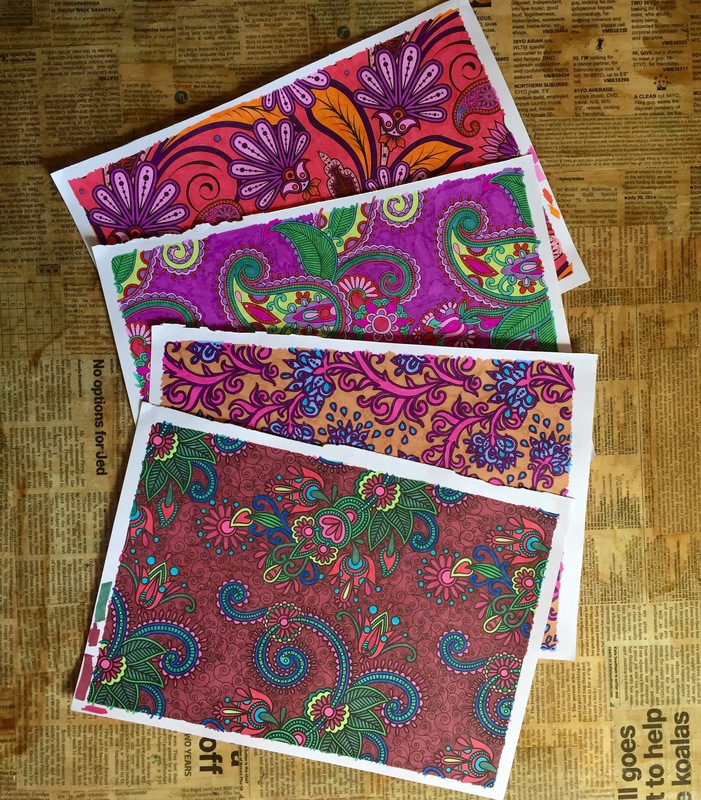 I love Paisley patterns, I love colouring in pages, I love upcycling, I love decoupage. Today I brought all of those things together. 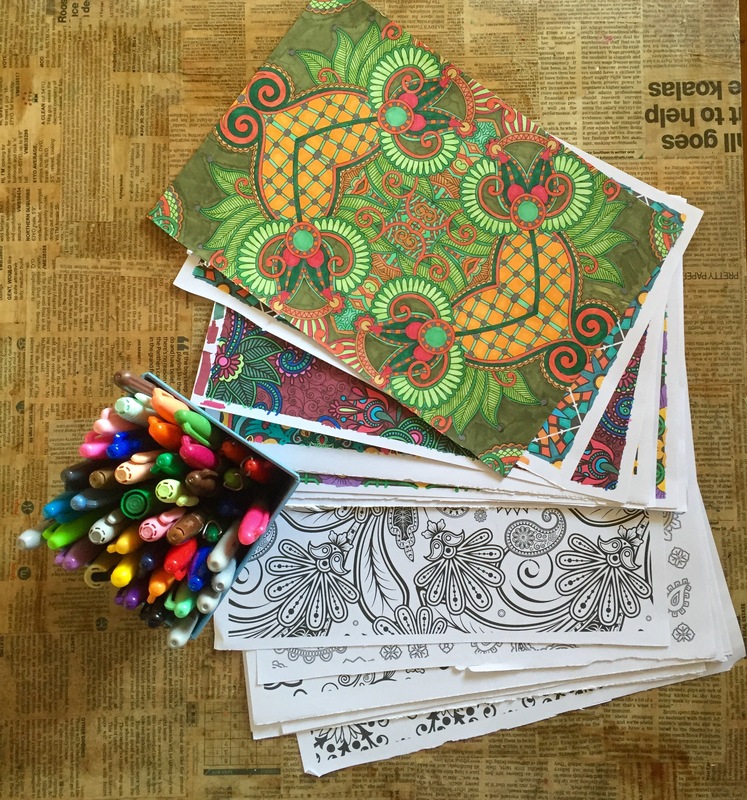 As I’ve told you, I’ve been doing a lot of colouring in lately and I have accumulated quite the stash of coloured in pages. 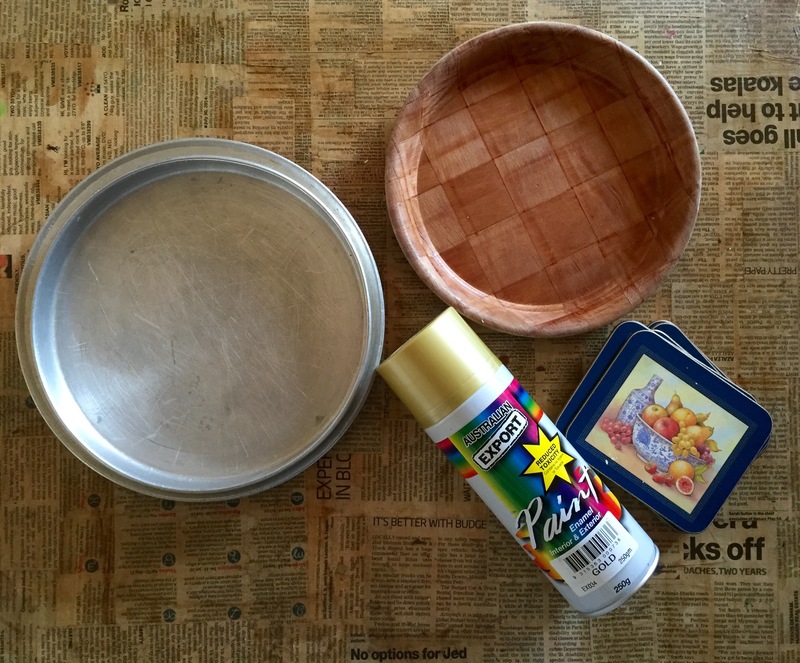 I decided they’d be super for decoupaging, and went on the hunt for some items to upcycle! 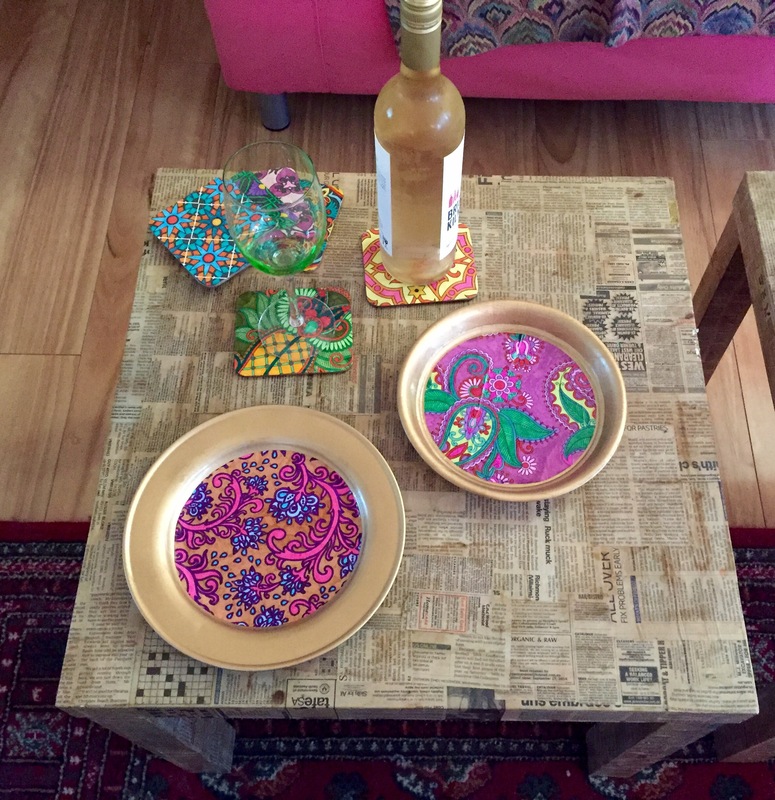 Some coasters that had seen better days and some old tin and wooden trays from the bargain bin at the op shop, coupled with some gold spray paint, and I’m set! 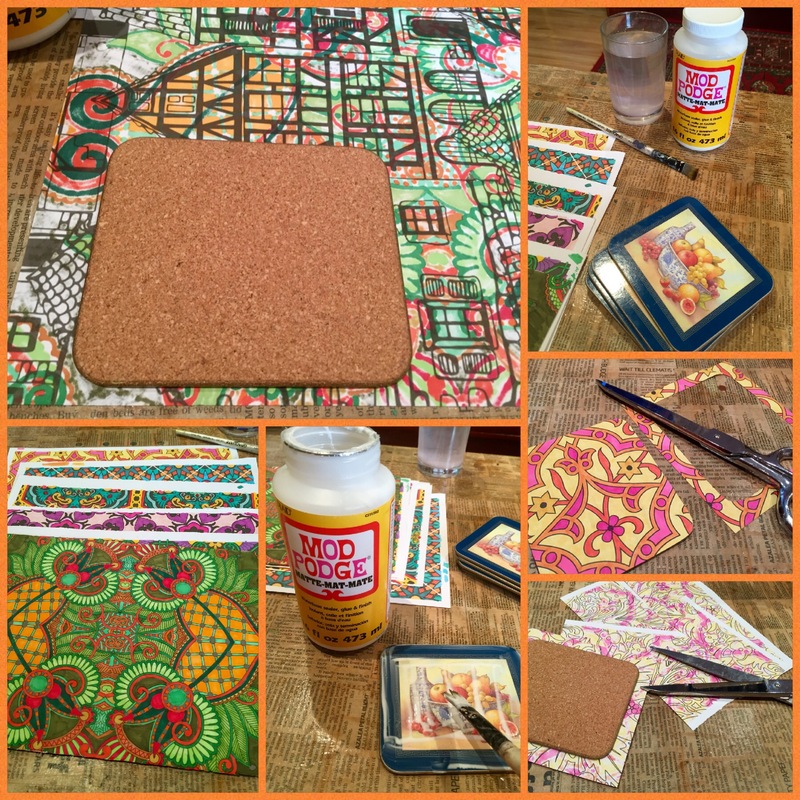 I started with the coasters- glue, press, dry, trim. These already had a gold edge, so there was no need to paint. I wanted a very glossy finish, so a couple of coats of acrylic gloss spray over the top of the mod podge makes for a durable easy to clean finish. Then for the little trays. Firstly several coats of gold paint. 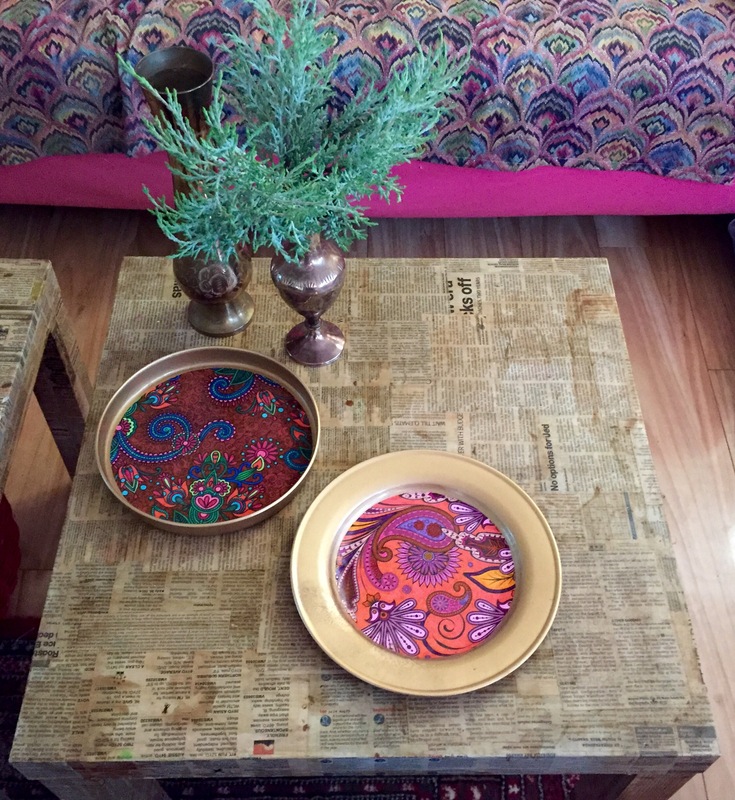 Once dry they were ready to be decoupaged. Hint: I used a compass to make the circles, so much easier than trying to eyeball it and screwing it up!! Again, once the mod podge was dry I sprayed with acrylic gloss. Oh my god I love these so much!!!!!!! 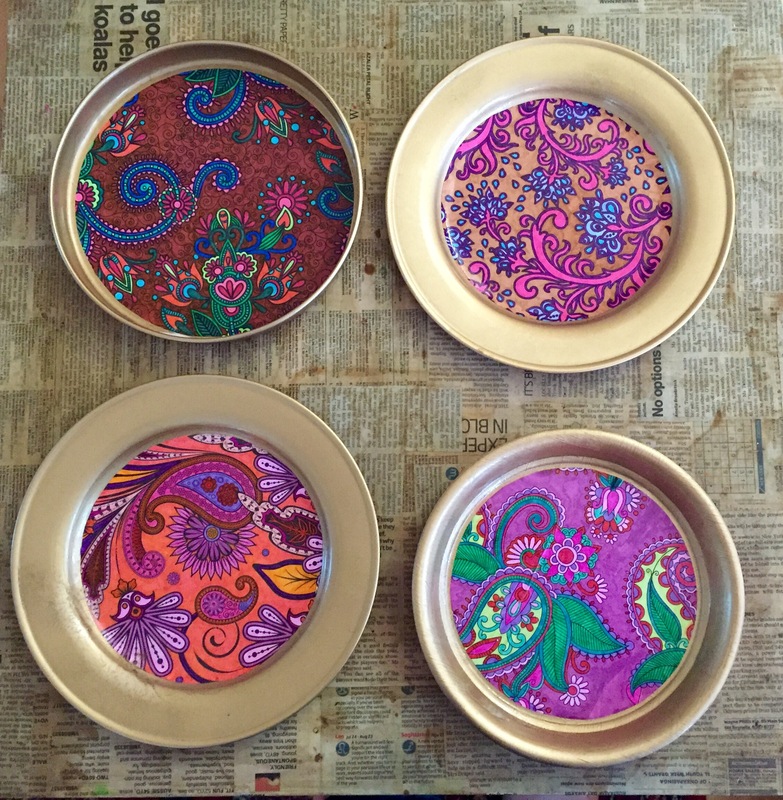 I am so totally envisioning more boho-colouring-in-page-decoupage in my very near future!!!!!!!!! 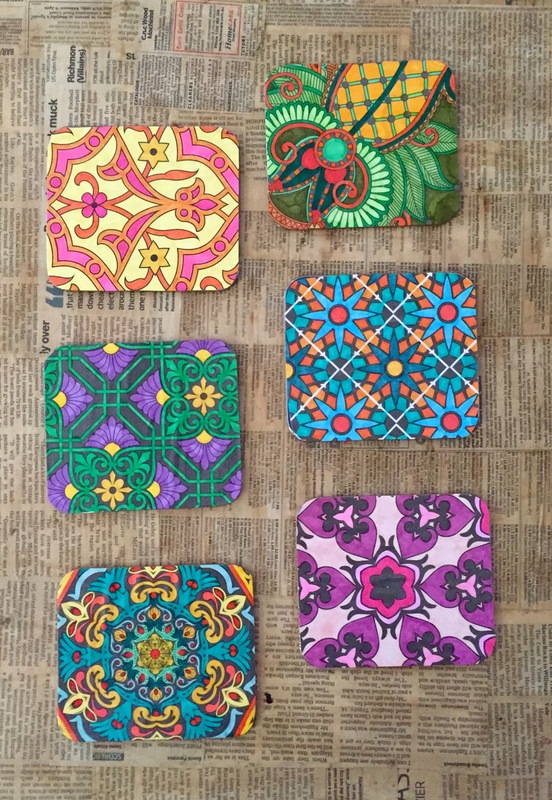 This entry was posted in Craft Projects, Decorating, Home DIY and Decor, Upcycled Projects, Upcycling and tagged bohemian, boho, coasters, coloring, colouring, craft, decoupage, ethnic, paisley, project, trays. Bookmark the permalink. 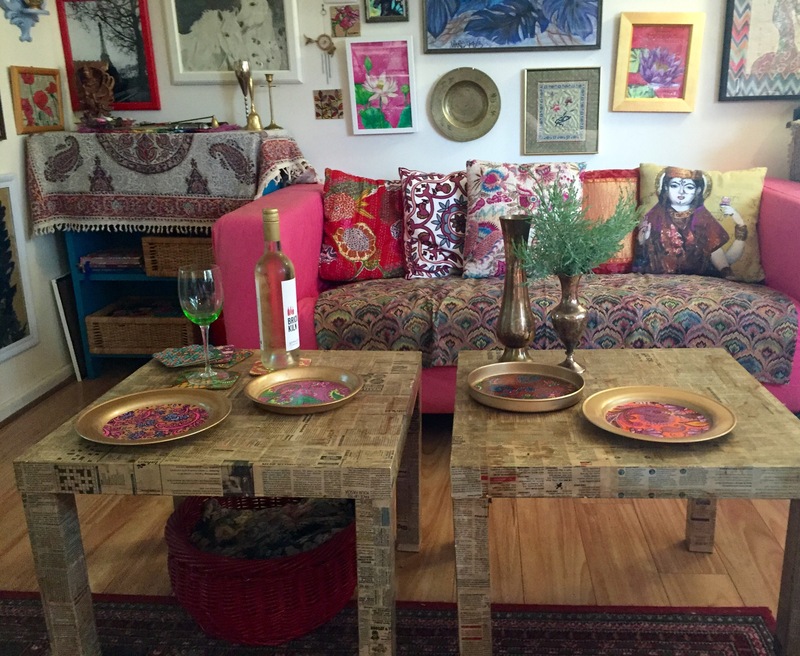 6 Responses to Boho Decoupage! Oh I just LOVE this idea! 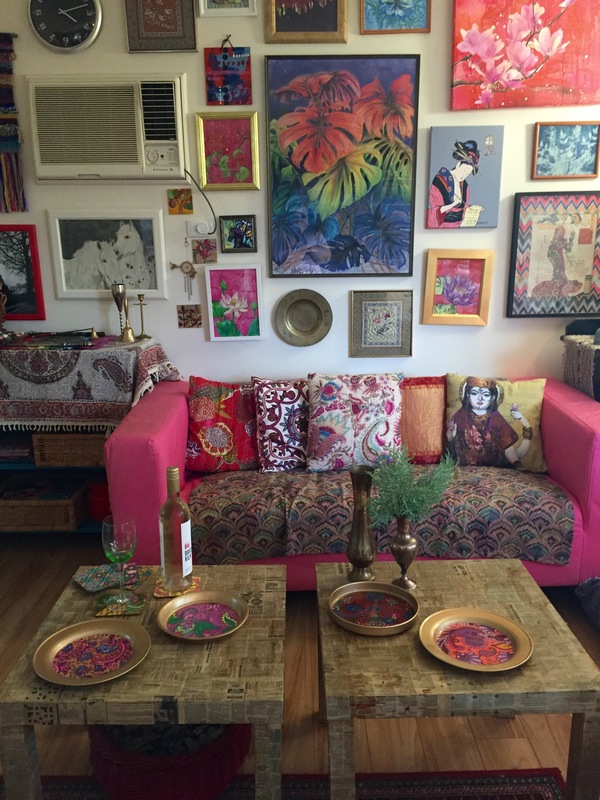 I’m a big fan of bohemian style but I prefer it in a minimalistic version. 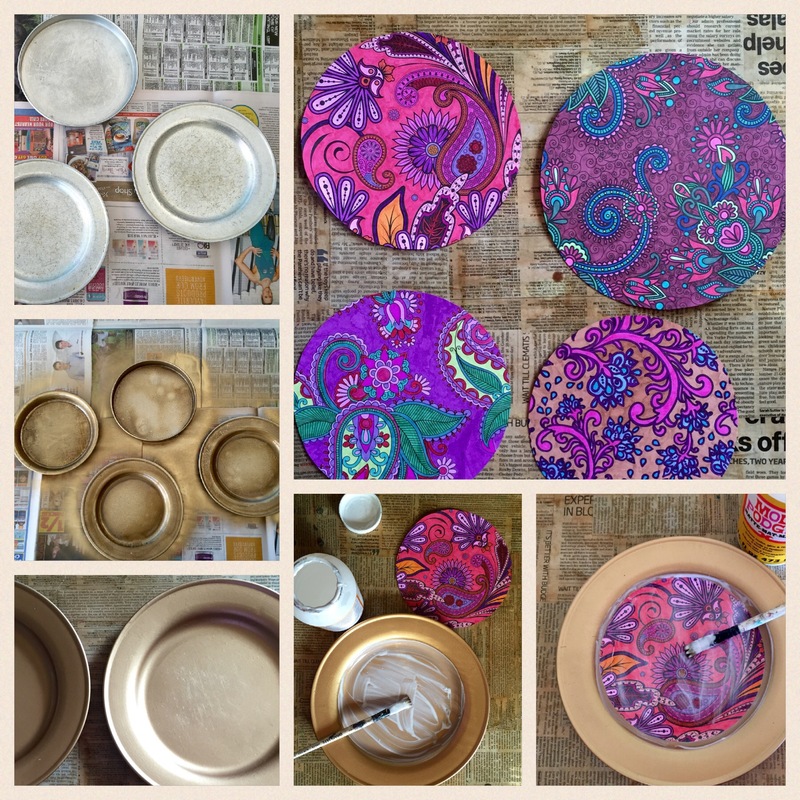 I think this DIY idea could work great for adding some bohemian color in my neutral pallet! Good luck with the move, wow!!! !